The color red is very difficult to achieve in ceramics. The most vibrant red within the reach of the average potter is the color produced by copper in reduction firing. There are many sites and pages that deal with this topic and overcoming the difficulties of achieving the range of red and maroon colors possible. The Copper Red effect shows the importance of correct firing to achieve a specific effect with certain glaze recipes. The inside of this vase was more heavily and consistently reduced, simply because it was isolated somewhat from the outside kiln atmosphere. The outside of the vase, by contrast, is grey (a product of periods of oxidation during the firing). What really is a reduction copper red glaze? 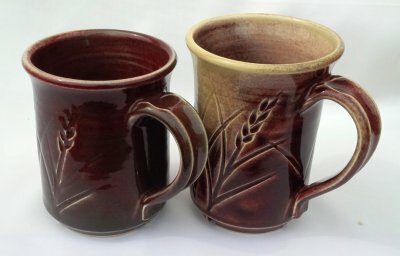 I am looking for patterns in Cooper Red glaze chemistry and not finding any. 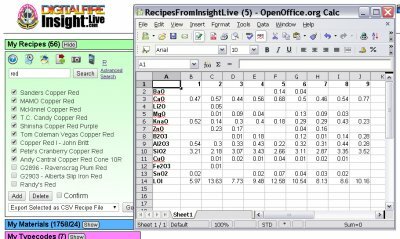 I pasted some recipes I found on the net into my account at insight-live.com, then exported them as CSV, opened it in Open Office Calc, removed the unneeded rows, transposed it, fiddled with the column and row titles and combined some rows to get this. CaO varies alot, so does KNaO (I expected the latter to be high always). The Al2O3 is all over the map, so is B2O3. Even the copper sees a four-fold difference! Some have or have no ZnO, MgO and Li2O. However SiO2 is always 3.5 or lower and CaO is always above 0.45, while that is at least something of a pattern, most cone 10R glazes have this anyway. 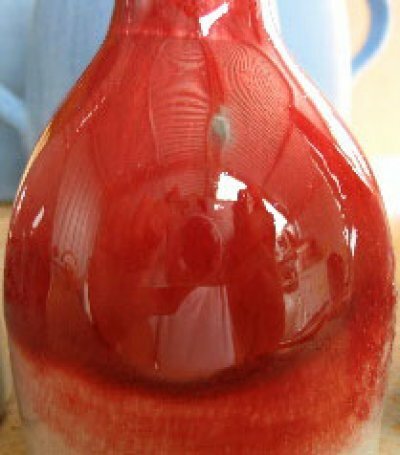 It seems that just about any transparent glaze will make a copper red. 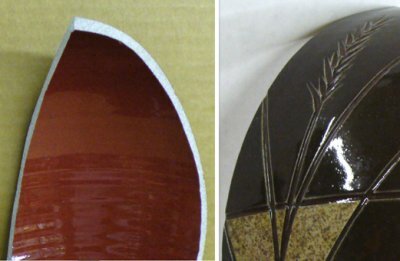 Copper red glazes require tight control of the reduction firing. The mug on the left is grey and brown by the foot, the other has developed no color at all on some parts. These were fired to cone 10R with reduction starting at cone 010 and going all the way up. There was no clearing or soaking period at the end of the firing. This is the Red Celadon recipe.